The time for sweaters, windbreakers, swimsuits and pumpkin carving is all over, and winter is upon us! With the temperature continuously dropping quickly all across the country, it leaves us no choice but to brace ourselves for the chilly months ahead. Polar fleece lined. Fold Over Hands and Feet. Built in elastic in the hood for better fit. Whether you want to indulge the memory of your kid’s first snow or maybe want to go on a trip on this winter wonderland, it is quite important that you make sure that your little one is cozily and properly bundled up! That’s where the best baby winter snowsuits take the spotlight. Whether you want your baby to look as cute as possible or in need of a pair of snowsuits, our list has the best snowsuits for every desire and need! One of the best snowsuits for babies this 2018, the Columbia Tiny Bear II Bunting comes in various colors and design that you will love. These include sky blue, pink and gray, raspberry and gray, cactus pink, collegiate navy, red spark, peninsula, eve, super blue, mountain red, deep blush, dark raspberry, and bark. Made from polyester material it boasts durability, warmth, and comfort during the chilly season. It has designs suitable for both baby girls and boys and comes with an asymmetrical zipper closure for the convenience of wearing and removal. This outfit is machine washable with fold-over hands and feet for versatility. Another snow outfit from Columbia, the Foxy Baby Bunting II is perfect for toddlers, infants, and babies. This baby boy suit is made from polyester that will make your little one warm and cozy. Pretty stylish, this snowsuit comes with a hood ears for extra warmth and comes with a functional zipper closure for quick removal and wearing. Also, it has an embroidered logo on its chest and a paw print detail for aesthetic appeal. This machine washable snowsuit comes in various colors and design— mountain red, bright plum, pacific rim, dark raspberry, black, deep blush and super blue and collegiate navy. For baby boy’s snowsuit, you can never go wrong with the iXtreme Winter Snowsuit. Made from polyester material, this outfit comes with a flexible and simple design for easy wearing and providing warmth even for the coldest weather. It has a practical zipper closure for easy wearing and removal as it has an elastic hood to ensure a better fit. Also, this snowsuits features a polar fleece lining and long sleeves that will keep your baby boy warm and cozy. It is water and wind resistant and features fold-over hands and feet for fashion versatility. The Snuggly Bunny Bunting from Columbia is among the top snowsuits for babies in the market today. Proudly made in the US, this snowsuit features Omni-shield shell for durability, comfort, and strength. Its material is extra smooth and warm and comes with a 450-fill power down for lighter weight and extra warmth. This snowsuit can fit babies of various sizes and ages and is designed for both girls and boys. Also, it features a microfleece lining on the body and hood sections. Like other Columbia snowsuits, the Snuggly Bunny Bunting also comes in various colors and designs including timberwolf, collegiate navy, light grape print, bright plum and soft violet multi, pink deers and faded sky and so much more! For baby girls aged 6 to 9 months, this snow pram suit from Pink Platinum will surely fit them well! It has a simple design for easy wearing and removal that requires little effort. Despite its simplistic design, this stylish pink snowsuit provides ultimate coziness and warmth. It microfleece lining Sherpa trim on the hood, and long sleeve will make sure that your baby will not freeze in the cold weather. And in order to fit perfectly on your little one, Pink Platinum added a full doubled side zip closure on this snowsuit. Featuring a 2-piece design, this snowsuit is a trendy outfit for the cold months and ideal for various settings. Highly flexible, this snowsuits can be easily removed or worn and looks decent with other baby outfits. This snowsuit comes with zipper closure in order to properly secure it to your baby. This 2-piece snowsuit for baby girls come with various prints and design you will surely love. These include black and white polka dots, pink leopard and dove grey, turquoise bunny, leopard light pink, cozy pink leopard and dove grey, pink floral, turquoise heart, cozy navy ditsy and pink neon, fair isle snowflake, and navy star. The cream Camo snowsuit from Carhartt will make sure that your little one stays warm and cozy during the winter season, thanks to its 100 percent polyester material. This high-quality suit fit babies of various ages and comes with a flexible and simple design for easy and quick rearing and removal. Featuring a gusted crotch, it prevents the suit from riding up and creating an extra space while its back pocket and utility pocket offers it an authentic look. This snowsuit also comes in a mobility split leg construction for improving its functionality. Coming in a grey print, the London Fog snowsuit looks amazing on newborns, toddlers, and infant, for both girls and boys! It is made of 100 percent polyester and has a solid and good tailoring that boasts durability. It has a thick down alternative filling offers the desired warms and its smooth interior will keep your baby comfortable and cozy. For added comfort and convenience, this snowsuit features detachable buttons, button closure, Car seat compatibility and hole for the straps. This snowsuit is also waterproof and comes with a zipper closure for easy wearing and removing. You also get a lot of option on designs thanks to its variety of prints and colors like peninsula critter blocks, timberwolf, cupid critters, collegiate navy critters, crown jewel snowflake emboss, pesto blocks, peninsula blocks, and collegiate navy critter blocks. Machine washable and made with polyester, this snowsuit for baby girls from U.S Polo Assn., ensures that your little one will stay warm and cozy while providing you with the convenience of easy wearing and removal. 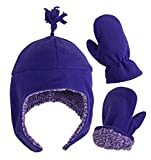 It comes with convertible mittens and is water resistant so you do not have to worry about going out on a cool, chilly day. This snowsuit comes in various girl-ish color like fuchsia, winter white, mint, English rose, light pink, pink rose, and baby pink. 1. What should I look for in a snowsuit? The first thing you need to check for is insulation. There are some snowsuits that are not fully insulated or might be insulated only from the top down. If you want maximum warmth, make sure that you get a suit that is fully insulated. Another important factor is adjustable straps on snow pants since they ensure usage for multiple seasons as your baby grows. Also, check for asymmetrical zippers which ensures that you can take your little one out in an instant in case of hygienic emergencies. 2. Are snowsuits safe for car seats? No snowsuits or coats are really car seat safe. Slippery material and bulkiness are not ideal for car safety. As an alternative, make sure to keep blankets in your car so that you can keep your little one arm in the car without inhibiting safety. 3. Should I get a 2-piece or 1-piece snowsuit? For babies and infants, a one-piece snowsuit is usually recommended since they are easier to remove. However, if your little one does not have issues with bathroom emergencies, or car seats, then you can try two-piece snowsuits. 4. I got a snowsuit with a hood. Should I still buy a snow hat? Yes, we highly recommend that you still but a snow hat. There is always a chance that the hood will not perfectly fit so having a hat is insurance as well as an extra warmth. 5. What should my baby wear underneath a snowsuit? It is best for your little one to wear cotton material clothing underneath his snowsuit since other materials can be itchy and uncomfortable as it rubs against the snowsuit. You do not need to stay home and cover your little one in blankies when the winter season comes. With the best baby winter snowsuits, you do not have to worry about the freezing weather and allow your baby to enjoy the winter wonderland while staying warm and cozy!